The plastics mould and die industry is one of the most dynamic and vibrant growth sectors within the Malaysian manufacturing sector. With over 1,550 manufacturers, Malaysia is among the largest plastics producers in Asia. But the industry is expected to see a slight decline in 2012 with growth resuming in 2013, said companies interviewed at the recent M�sia Plas show in Kuala Lumpur. China�s largest plastic compounder Kingfa Science & Technology reported 30% lower profit in the first half of the fiscal year, due to the slowdown in the markets it serves, which include the automotive, appliances and electronics sectors. Institutional investment firm Ironridge Technology has invested US$5 million in American bioplastics manufacturer Cereplast, which has been beset with low sales and production stoppage. It will also allow the firm to expand in India. Meanwhile, PLA maker NatureWorks is increasing its capacity to 150,000 tonnes/year, using new equipment from Swiss firm Sulzer Chemtech. US firm Nordson Corp. has bought Sealant Equipment & Engineering, which makes metering, mixing and dispensing equipment and valves. Nordson had also earlier in the year purchased screw/barrel maker Xaloy and die maker Extrusion Dies Industries. Japanese firm Mitsui Chemicals is investing 2.5 billion yen to add 8,000-tonne/year capacity of its speciality Tafmer high performance olefin elastomer at its Singapore plant in Jurong Island, by 2013. In other news, Mitsui plans to restructure its joint venture petrochemical operations in Chiba, Japan, it runs with partner Idemitsu Kosan. As part of its new international strategy, Versalis aims to gain a leadership position in emerging markets by leveraging its technological and industrial expertise and its direct presence in the Asia-Pacific region will allow for better monitoring of the industrial and market dynamics, and for direct interaction with clients in sectors of strategic interest. Citing overcapacity and low margins in the EPS market, German chemical firm BASF is closing down its Styropor EPS plants in Pasir Gudang, Malaysia, and Thane, India. 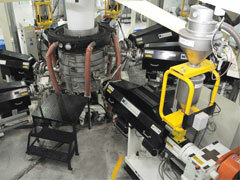 The combined EPS capacity of the two plants is more than 100,000 tonnes/year. American researchers say that children exposed to diethyl phthalate (DEP) and butylbenzyl phthalate (BBzP) � phthalate chemicals commonly found in personal care and plastic products � have elevated risk of asthma-related airway inflammation. US-based MGP, a grain and other plant-based ingredient solutions company, has developed Terratek BD, a new line of biodegradable composite resins. Meanwhile, bioscience firm Green Dot has also introduced a compostable bioplastic, a soft rubber-like material that has been used to make the BioCase phone cover. Japanese firm Teijin and Kansai University have developed a flexible, transparent piezoelectric material that demonstrates what it says are �unprecedented piezoelectric effects�. The new material comprises laminates of PLA, PLLA and optical isomer poly-D-lactic acid (PDLA) films. To deter false or misleading communication of environmental product properties, European Bioplastics, the association for the European bioplastics industry, has published its Environmental Communications Guide for Bioplastics. By adding modifying agents to plastics, modified plastics have increasingly found uses in the automotive and home appliance industries in China. Output increased from 320,000 tonnes in 2000 to 5.84 million tonnes in 2009 and is expected to hit 8.53 million tonnes in 2012, says a new report from Research in China. MonoSol, a manufacturer of water soluble films, has launched Vivos Edible Delivery Systems. Water soluble and edible, pouches engineered from Vivos films disappear and release their contents when exposed to hot or cold liquids; the dissolved film can then be consumed along with the food. Fourteen local business groups have put out full-page advertisements in various major newspapers in the Philippines on the last day of August to castigate the ban of plastics in the country, asserting that the ban may do more harm than good to the environment. US-based extrusion machinery maker Gloucester Engineering and Italy-based Dolci Extrusion will share winding technology and offer customers a choice of either Gloucester or Dolci winders for cast stretch film. The High Tech Extrusion group presents its new TEC 4s as retrofit kit, which has been developed with Siemens according to the newest state-of-the-art technique, and combining simple handling and a uniquely efficient control system . Reifenh�user, a global extrusion lines provider closed the 2011/2012 financial year with record results, generating total sales of over EUR 450 million. Reifenh�user Kiefel Extrusion has added a new, user-friendly high-performance cooling system to their new Evolution blown film line generation that it said will make it possible for film manufacturers to significantly increase output capacity. Using DuPont Performance Polymers�s Vespel TP bearing cages, Harmonic Drive of Germany, has developed a lighter and more compact component gear set, used in industrial service robots, medical technology, aerospace and semi-conductor manufacturing. Austrian machine maker Engel has expanded its working relationship with US-based MuCell foam injection moulding technology supplier Trexel by fully integrating MuCell units into the victory and e-victory series machines, thereby improving the price-performance ratio of system solutions. French 3D design software firm Dassault Syst�mes has introduced SolidWorks 2013 with 200 new and improved design applications to enhance collaboration, speed model creation and simplify the product development process. Specilty chemicals firm Lanxess, known for its light-weight materials and green mobility concept for the automotive industry, has recently acquired German company Bond- Laminates GmbH, a manufacturer of custom-made plastic composite sheets that are reinforced with materials such as glass fibres.